Tractor-trailer accidents and accidents involving large trucks frequently cause devastating injuries or death to the occupants of smaller motor vehicles. A typical large commercial truck can weigh as much as 30 times that of a passenger automobile. Due to this size disparity, any collision between a truck and a passenger vehicle is likely to result in disastrous consequences. Therefore, trucks are subject to special traffic laws and regulations to minimize risk posed to the public. Our knowledgeable team can uncover violations of regulations related to truckers in order to help victims prevail in their case. Our firm will aggressively and tirelessly pursue maximum compensation for our clients’ pain and suffering, lost earnings, lost earnings potential, past and future medical and hospital expenses, and loss of enjoyment of life. Injury victims of truck accident often have sustained severe injuries in accidents with tractor-trailers and other large trucks, they also suffer Post Traumatic Stress Disorder, (PTSD) with the disabling effects of nightmares of the accident, anxiety, recurrent recollections of the event, and fear of driving on highways due to their life threatening experience in the truck accident. It is vital that you retain attorneys who have the requisite background and experience in handling cases of PTSD, in addition to the physical and financial injuries that you have suffered. There are numerous causes of truck accidents, including: inexperienced and overworked drivers; aggressive drivers; reckless drivers who operate their tractor-trailers at excessive speeds, follow too closely, or make unsafe lane changes; drivers who fall asleep or are drowsy at the wheel, overweight vehicles; or improperly maintained vehicles with defective tires, steering, brakes or lights. We will vigorously and thoroughly investigate the causes of the accident, including retaining accident reconstruction experts, engineers, and investigators, to ensure that critical physical evidence is preserved for litigation. In truck accidents, (as in other types of vehicular accidents involving cars, buses and motorcycles) physical evidence is often vital to the successful prosecution of the case. We retain investigators to conduct a prompt investigation of the scene of the accident, to secure photographs of skid marks, accident debris, statements of witnesses to the accident, and photographs of the vehicles involved in the accident whenever possible. 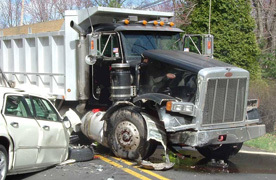 Our attorneys have the knowledge and expertise to effectively represent clients injured by negligent truck drivers. Contact our truck accident lawyers today for a free case evaluation.